Bananas range in color, from the popular yellow banana (the sweetest of all) to the red bananas (with a slight raspberry flavor). Plantains are a member of the banana family, but contain much more starch. They are not to be consumed raw, but are cooked into a number of West African and Caribbean dishes. They are longer, with a thicker skin, and are usually green. The Japanese fiber banana has the shape of a coconut and doesn’t really resemble a banana at all. It’s inedible, but it is commercially grown to produce fabric. More proof of the versatility of the banana! Bananas are radioactive! In all potassium that occurs naturally, you’ll find the isotope potassium-40. Since bananas are such a good source of potassium, it follows that there will be an element of this element in there. One 100 gram banana provides more than 10% of the U.S. Recommended Daily Allowance of potassium, 15% the USRDA of vitamin C, and 10% the USRDA of dietary fiber. It is very low in saturated fat, cholesterol and sodium. 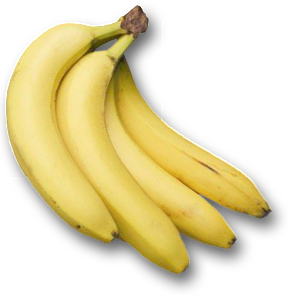 The bulky nature of bananas will give you a “full-stomach” feeling to take away the hunger pains of the day. Ideal snacking: healthy, satisfying, tasty – and you don’t need vending machine change! Cavendish bananas (the yellow bananas we’re most familiar with) originated in the Indo-China area. It is mutated from hundreds of other varieties. United States immigrants were given bananas when they reached Ellis Island in New York. As many had never seen one before, they didn’t know they needed to peel them, and ate them whole! The Siam Ruby banana is a decorative plant which produces nothing edible. It is grown for its beautiful red fruit and leaves and is very rare. Originally from the wild areas of New Guinea and commanded prices as high as $1,500! For all its complexity, don’t forget the banana basics: peel, eat, enjoy! To get bananas and other delectable produce delivered to your Dallas/Fort Worth office, contact ORCHARD At The OFFICE!